Macular Degeneration is the most prevalent disease for blindness in the world. Macular Degeneration, also known as AMD and ARMD (for age related macular degeneration), is a disease that breaks down the macula. The macula is the light-sensitive part of the retina which is responsible for the sharp and direct vision that we need to drive or to read. In most cases, Macular Degeneration is related to aging and is more common for people over 65 years of age. There are some cases of AMD that occur due to a genetic disorder or a side effect to some drugs. 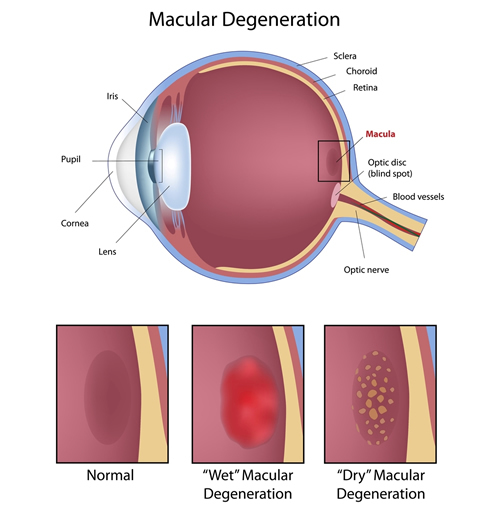 Wet macular degeneration is more commonly associated with vision loss but Dry Macular Degeneration is more common. A healthy diet including antioxidant vitamins and minerals can protect the macula from damage, especially beta-carotene (vitamin A), Vitamin C, and E.
A drug treatmen,t called Visudyne drug treatment, is a drug therapy for the wet form of the disease that destroys abnormal blood vessels in the eye. This procedure is virtually painless. A Laser treatment, called laser photocoagulation, destroys new blood vessels to prevent leakage and it may help wet AMD patients. Low vision devices for vision loss is another treatment method that helps improve vision by using magnifying lenses and bright lights. If you or a loved one has macular degeneration, talk a physician at Midshore Surgical Eye Center today and we will determine the best treatment for you and your visual needs. To learn more about Macular Degeneration, click on the video animations below.